Headlines like these highlight some of the new technological advances that are changing ways we do archaeology. New approaches to trace element analysis, detailed DNA studies, and refinements to carbon dating have all shed new light on what we can learn from artifacts. And this new information helps guide archaeologists as they incorporate that into our interpretations of people and cultures from the past. 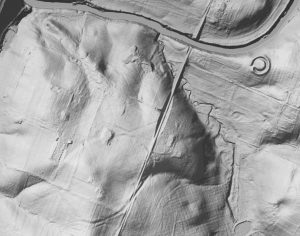 LiDAR, or Light Detection And Ranging, is another technology that is changing the way some archaeologists do their work. By measuring reflected laser light, we are able to calculate distances with great accuracy. 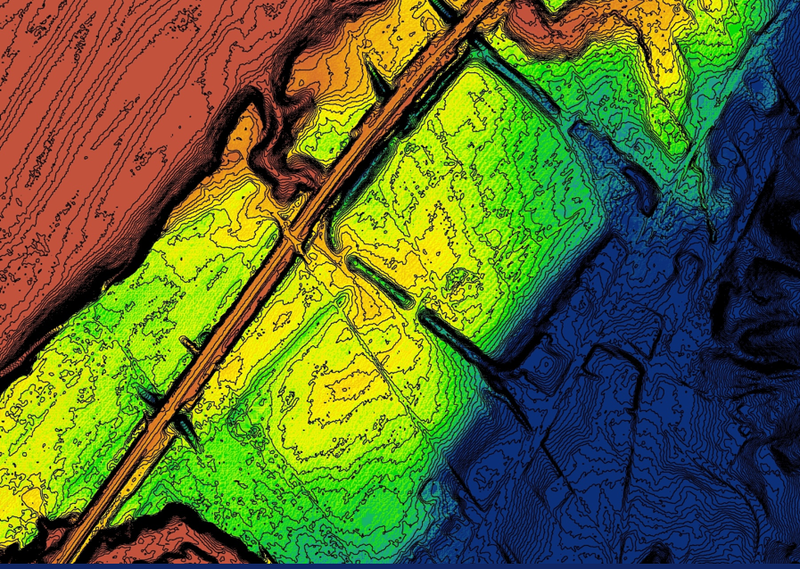 When mounted to an aircraft, this technology collects vast amounts of data, creating high-resolution mapping over large areas in a short amount of time. It records data from all surfaces, including trees and buildings and bridges. 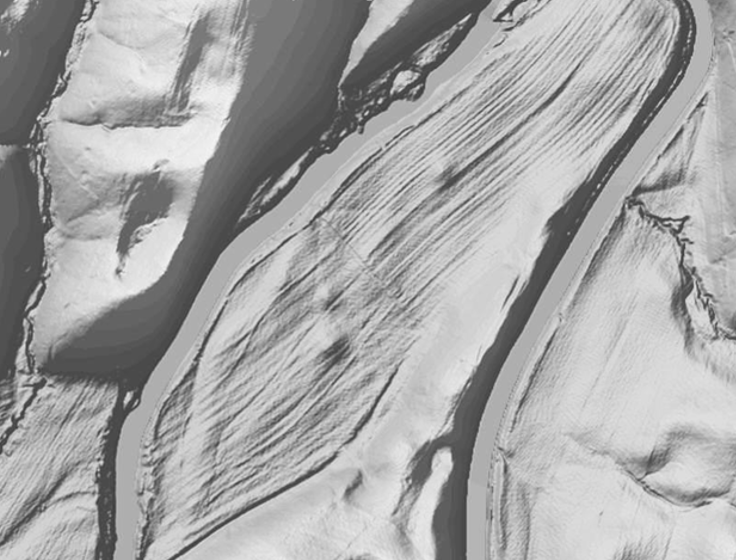 But we can turn off this above-ground data to show just the detailed ground surface. This is called a digital elevation model, or DEM. 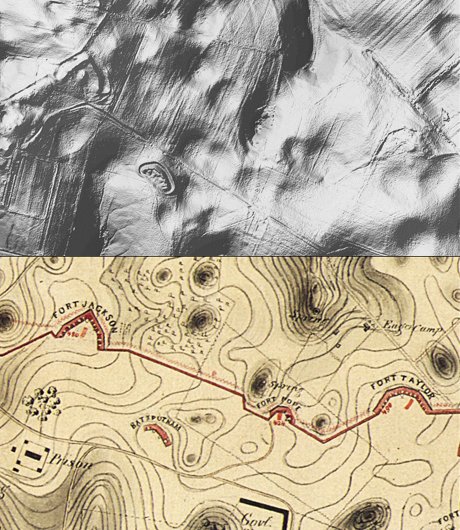 And this, my friends, is quite useful to archaeologists interested in landscapes and landforms. I’ve used these DEM’s to reexamine known archaeological sites, such as a portion of Old Fort Earthworks in Greenup County. These Hopewell earthworks date to approximately 100 AD, and are part of a much larger complex of earthworks that extend throughout the region. Railroads, roads, and residential development have all impacted this site, but many tell-tale prehistoric features still remain. Mt. Horeb/North Elkhorn Earthworks, which include earthworks dating from the Early to Middle Adena Period (400 B.C.-A.D. 250). The circular earthwork is very prominent, but there are many other prehistoric features that can be identified in this image. I enjoy pointing out other details in the data, such as the cross-hatched mowing patterns in horse farm pastures. I’ve also made comparisons between the current landscape and early maps Camp Nelson, a Civil War depot for the Union army. Can you spot the subtle signature of the rifle breastworks running between the heavy fortifications? 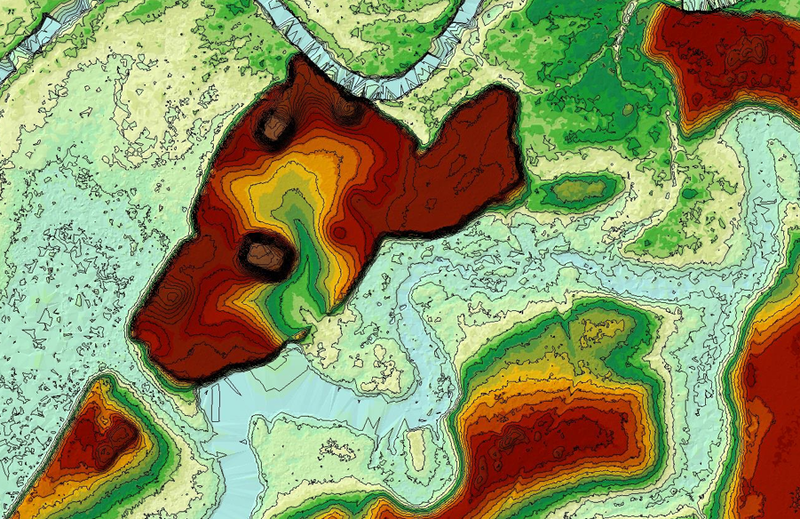 While looking at particular floodplain landforms, I’ve identified potential new earthen mounds or platforms adjacent to a documented Mississippian site. This information is shared with archaeologists who have previously conducted research at this site. Additional fieldwork is needed before archaeologists can confidently say these are new mounds. While systematically examining over 1,000 square miles of the DEM in Central Kentucky, I identified a series of three low mounds in a bottomland area. After consulting with the Kentucky Office of State Archaeology, it was determined there were no archaeological sites documented at this location. Field verification is still needed before we can say whether these are newly discovered prehistoric mounds or the result of other natural or recent human activities. Want to see this statewide DEM for yourself? Well here you go! 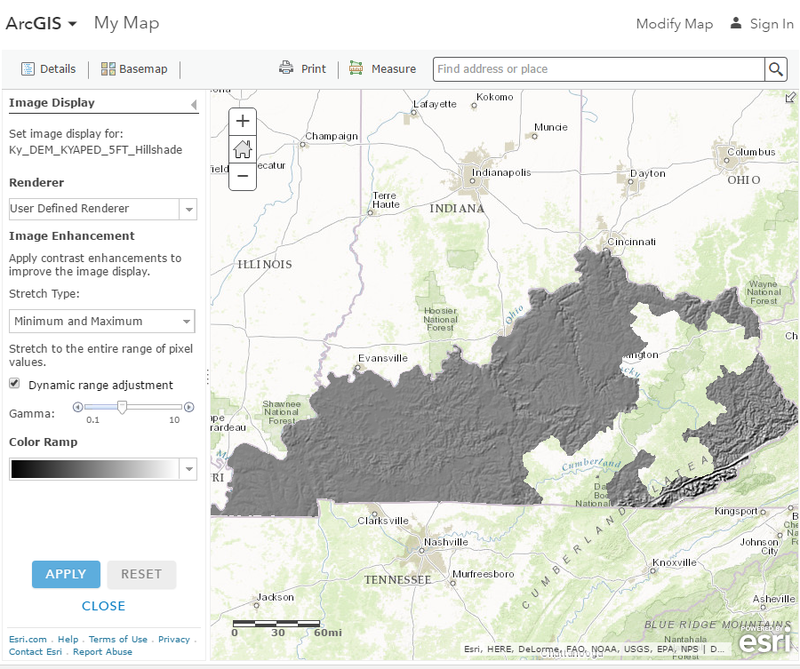 Below is a link to the KY DEM KYAPED 5FT Hillshade map. But please be patient. This is a lot of data and may take some time to load and refresh. After you’ve taken the data out for a ride and examined an area you were always curious about, try these next steps. In the Contents table on the left side of the screen, locate Ky DEM KYAPED 5FT. Open up “More Options” (those 3 dots) and select Image Display. It should expand. For Stretch Type select “Minimum and Maximum.” Turn on Dynamic range adjustment, then tweak the Gamma. Try something around 0.5. Experiment by trying the other stretches. Play with the numbers (eg Standard Deviation and 2). Like I said, LiDAR it is NOT a replacement for fieldwork. 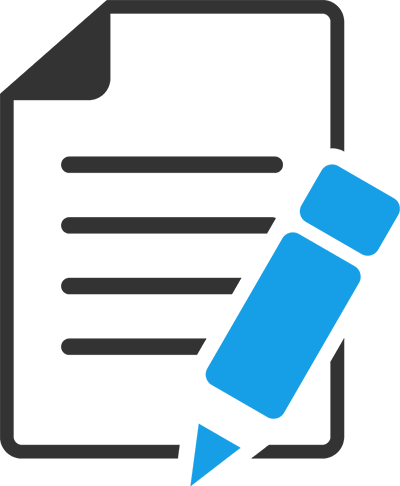 But it can be another useful tool in your tool box to help you quickly visualize and interpret the landforms and landscapes around you. Accurate contours, precise mapping locations, and landform modeling are all aspects that help guide fieldwork and research. Explore the data and the mapping. Seek out new discoveries. Remember…as both professional archaeologists and an interested public, we must be mindful of private property, be aware of the sensitivity and care often needed to protect archaeological sites, and work with landowners and preservation interests to ensure the recording and long-term preservation of Kentucky’s non-renewable cultural resources.